The strength of The Geology Trusts has always been its recognition of the benefits of working in partnership and the sharing of ideas and expertise. A small group of counties began working together in 2000, with immediate success, invigorating smaller groups and gaining funding for joint projects. They constituted themselves as The Geology Trusts in May 2003 and the partnership has continued to grow. 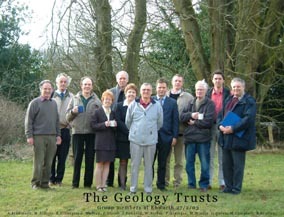 The Geology Trusts founder members. In less than a decade we have grown from a core membership of a few counties with a relatively small geographical footprint to now embrace a much wider area through the active participation of eleven counties. During that time we have attracted more than £350,000 of external funding, much of which has been matched by voluntary effort. Over the same period, our members have raised around £2 million for their county-based work. Significantly, The Geology Trusts is recognised as a key player in major geoconservation initiatives, current examples of which include the national Local Geological Sites database (with Natural England) and the Strategic Stone Study (with English Heritage). Networking – a forum for the sharing of ideas and experience. Best practice – the discussion and development of professional procedures and standardised methods and materials. Funding – seeking grants and contracts for collaborative projects and circulating information about national and local funding schemes to our members. Collaborative projects – these do not have to include all of our members as geology, workloads and interests vary amongst us. Each group simply selects those projects that they want to participate in. Some of our projects have been carried out in partnership with other conservation agencies and there is a growing interest in undertaking work on the basis of regional partnerships. Inter-county support – if a county group needs assistance from a neighbouring county, either in terms of expertise or manpower, this can be coordinated. Insurance – administering a central policy for paid project officers working for member groups or directly for The Geology Trusts. Participation in national initiatives and forums – we send a representative to the GeoConservation Commission of the Geological Society of London and to the Earth Science Education Forum (ESEF). We also participate in national conferences and respond to national consultations on conservation issues. We were part of the working group developing the UK Geodiversity Action Plan (UKGAP), and are assisting Natural England with the development of a national Local Geological Sites database. The Geology Trusts executive meets every four months. Additional project coordination meetings are arranged as required. Our meetings are enjoyable opportunities to associate with good friends and trusted colleagues. We welcome enquiries from other like-minded geoconservation groups seeking advice or considering joining us. Member organisations pay an annual subscription based on their turnover. This contributes to the central running costs of the organisation. We offer a nominal introductory subscription rate of £10 for the first year to new members.